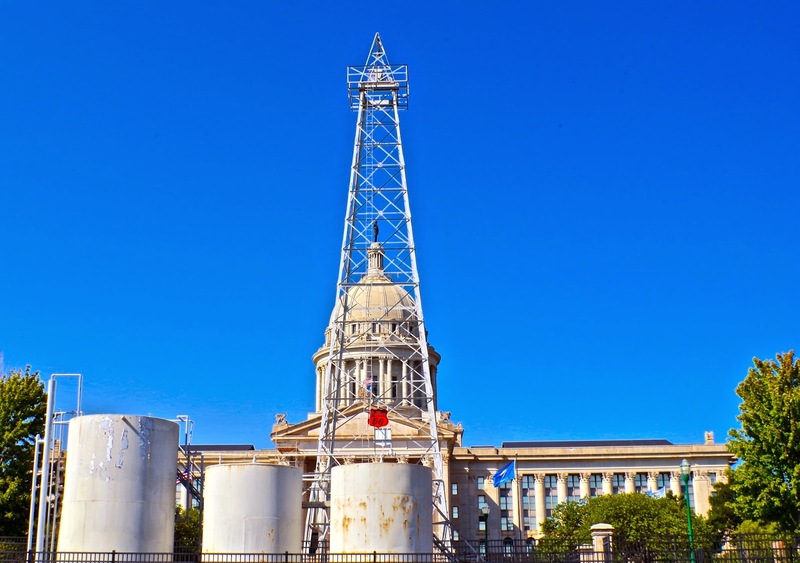 Just down the street is the Oklahoma State Capitol building...now how many Capitol buildings do you know of that have an oil rig in front of them? This one does! What a hoot! It even has a name, it's "Petunia No. 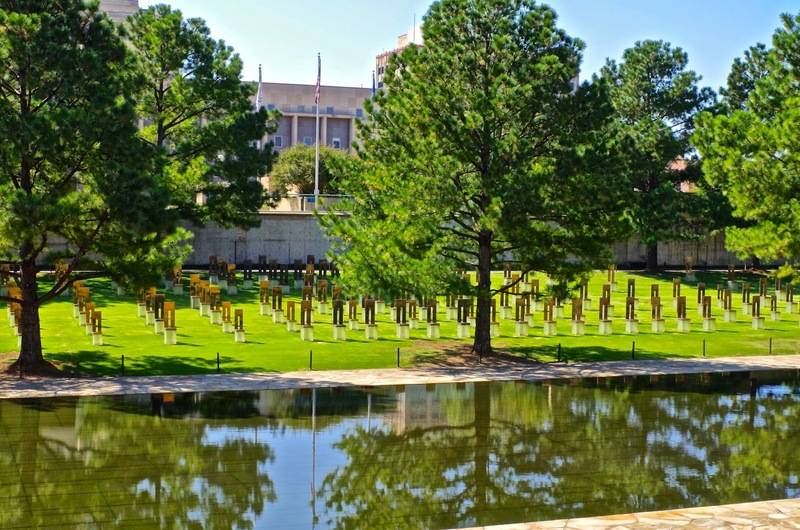 1", the retired Capitol Site No 1 oil well, because drilling began in November 1941 in a flower bed. 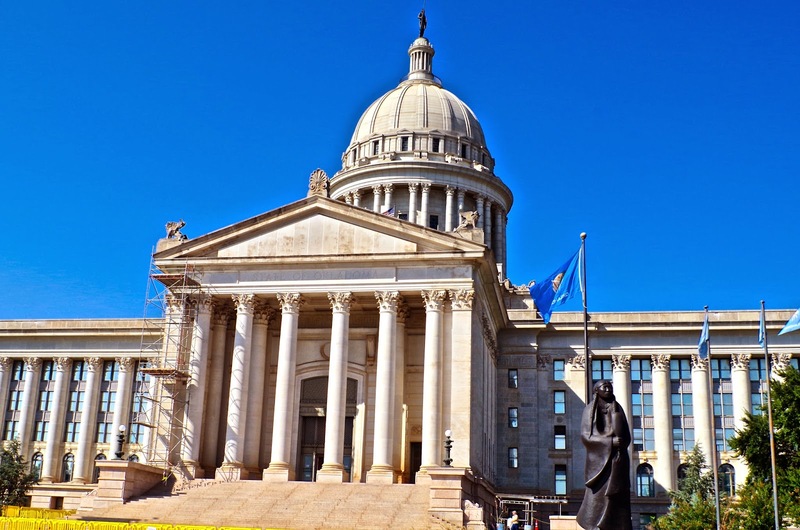 The building is said to be the only Capitol in the world with an oil well beneath it! Now it was time to see some real art! So off we went to the Oklahoma City Museum of Art. 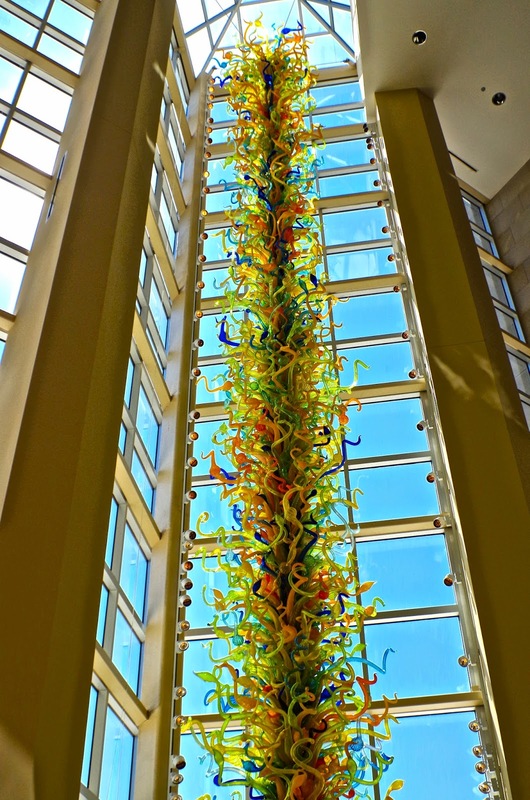 Well, the first thing you are greeted with is their 55-foot Chihuly glass tower in the front atrium! It was a beautiful sunny day so the sun just glistened right on it too. 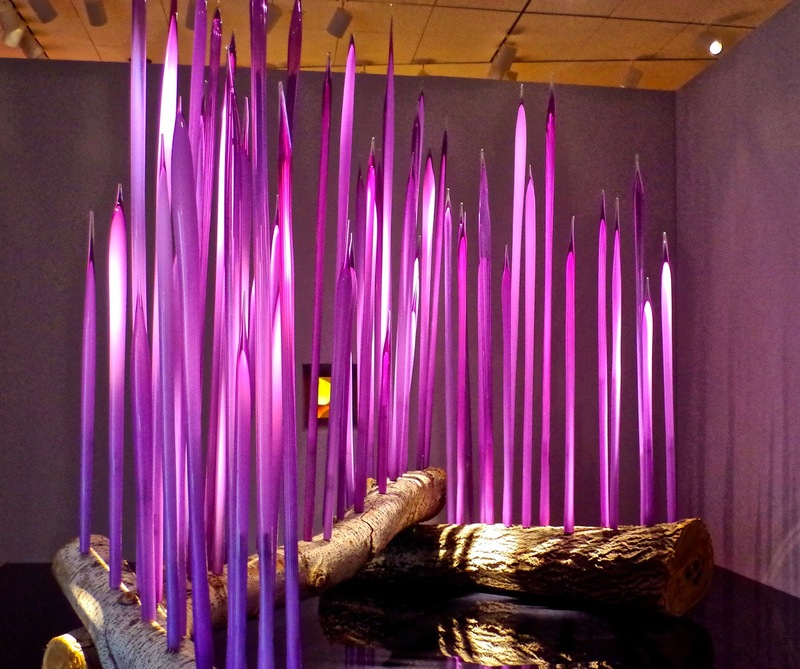 They have one of the largest collections of Dale Chihuly's art we've ever seen, and we've been to his studios in Tacoma, so this was an extra treat. 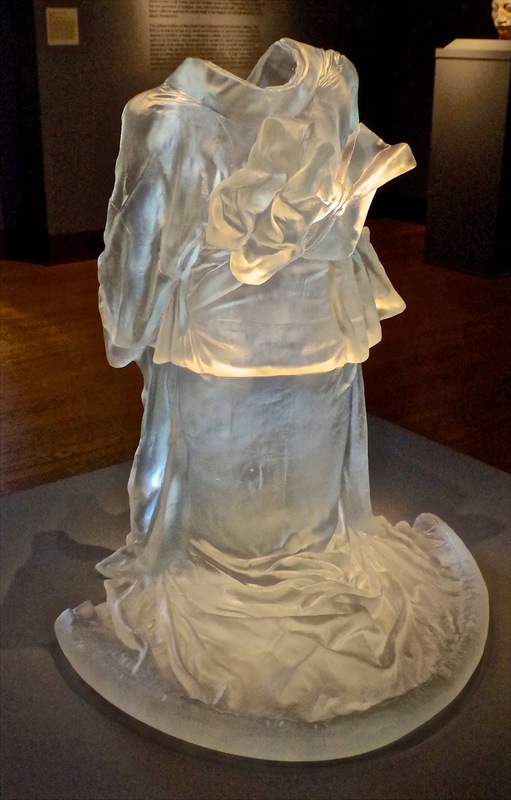 Additionally, they had some lovely European and American art that we enjoyed. Their Museum Cafe served a great lunch, and once we were fortified, we were ready to continue our trek to see more of the city! 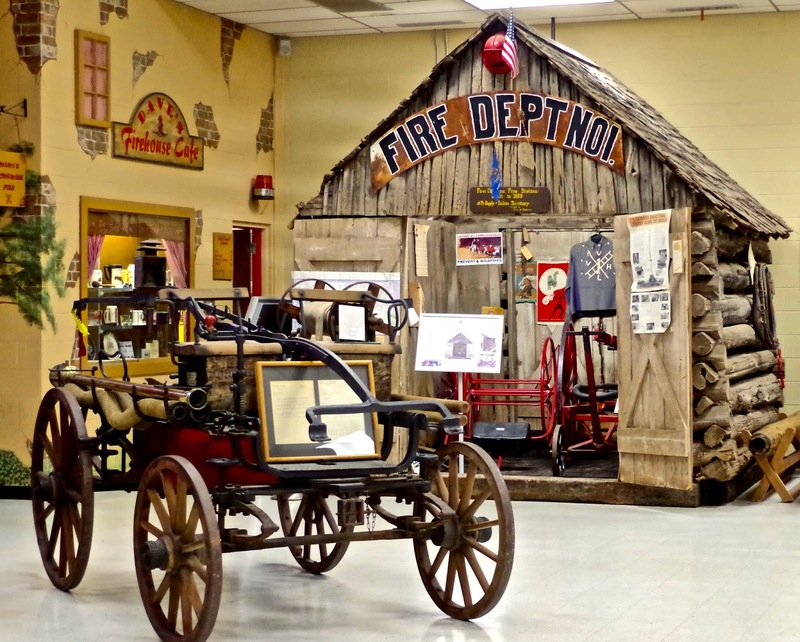 Close by was the Oklahoma State Firefighters Museum which didn't look to large, so we thought we could just fit it in before our energy gave up on us for the day. 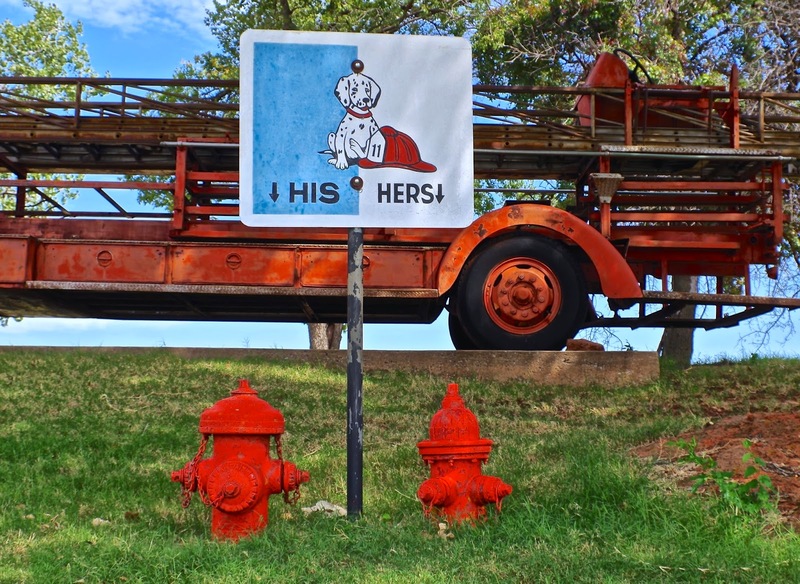 I loved the "his & hers" fire hydrants outside before you entered, cute. 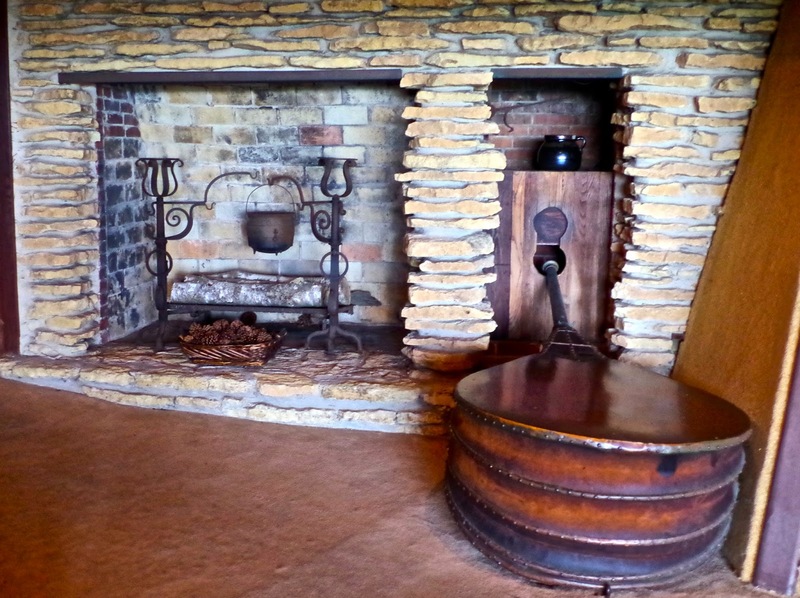 Inside they had a nice collection of antique fire apparatuses, tools and machinery used since 1736. The coolest thing was the reconstruction of the first fire station in Oklahoma, first built back in 1869. Phew, that was one full day, and still so much to see in this great city! Movies & Music, what a great exit to Kansas! 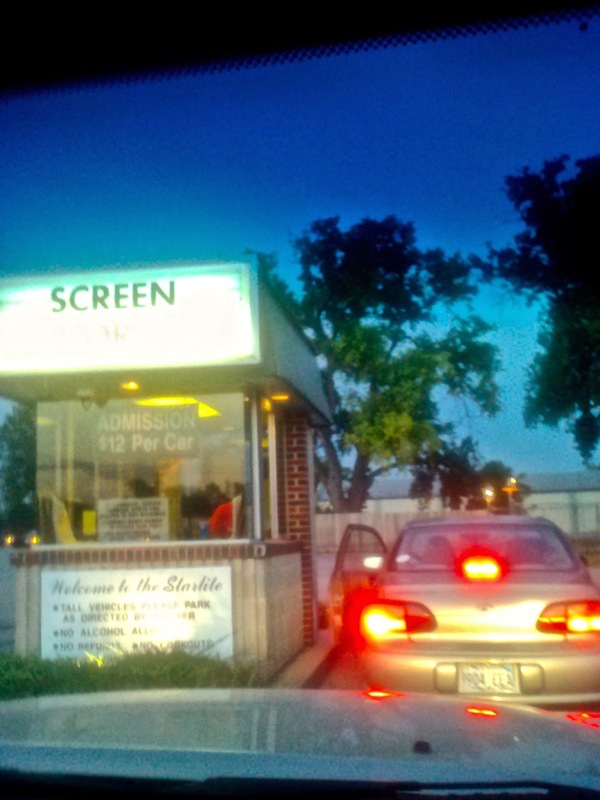 While driving around Wichita, Jack and I noticed the Starlite Drive-In movie theater that still was in operation. Hardly believing our eyes, we drove in and happen to run into the owner, who verified that yes, it opened at 7pm, showing three screens beginning a 8pm with two movies on two screens and three movies on one screen, each screen, $12 per car! “Wow!” We said, “We’d be back on Saturday night!” What a hoot! 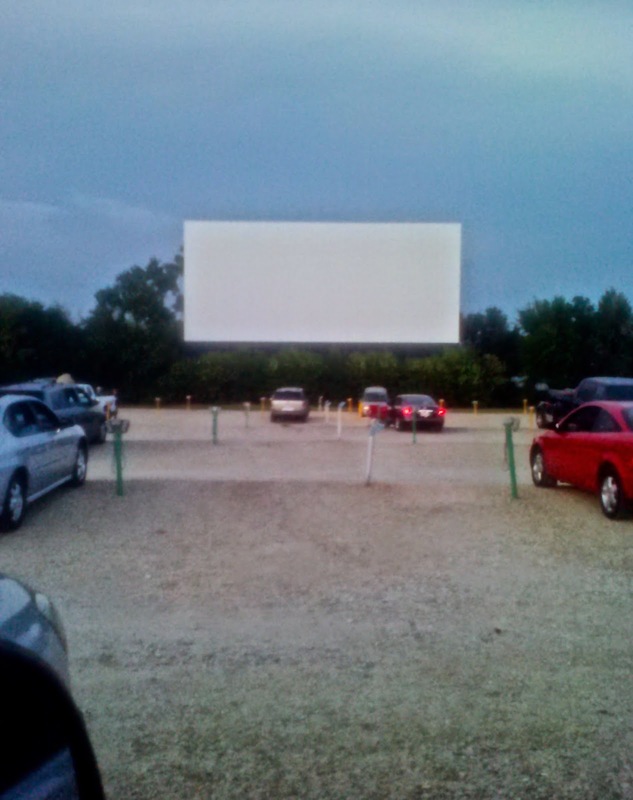 We started reminiscing, trying to remember the last time either one of us had been to a drive-in. 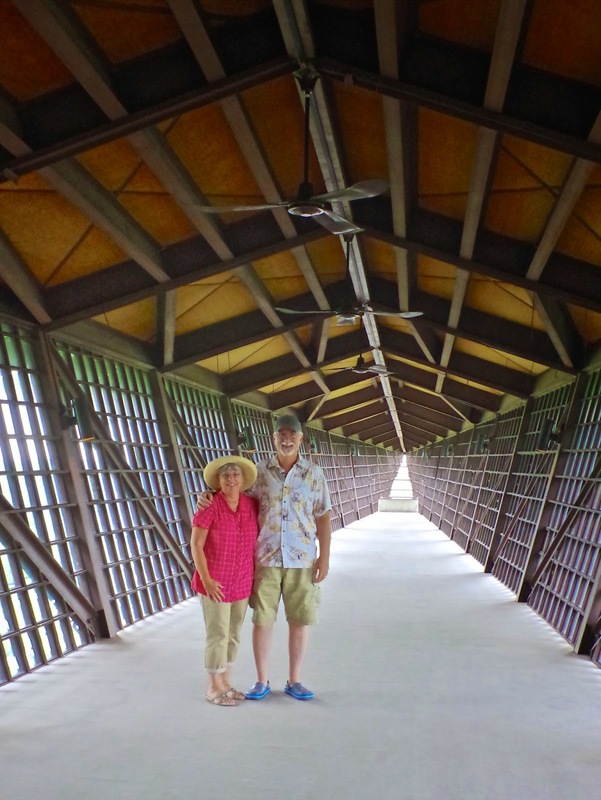 It certainly hadn’t been together…and for me, it hadn’t been since my own kids were little! For Jack, probably the same amount of years…so, we were talking about almost 30 years ago maybe? Now that's nostalgia! We decided we would “do it up right” - pick up some food & snacks, wear comfy cloths, bring pillows, the whole nine yards…and he had to promise to kiss me at least one time during the movie! I could hardly wait until Saturday night! Saturday came, Jack cleaned the truck windows and we loaded up. We chose the first screen. It came with the three movies, but there was no way we would make it all the way…we are way to old for that! Luckily the one we were interested in was the first movie, so that was the important thing. The “new thing” is you can use the speaker (so glad they kept those!) and/or you can turn your radio to a certain channel and get the sound. The speaker only had “on or off”, no other volume control, so I could see the reason for the radio - we just kept the speaker outside (it was a hot night, and that seemed to work just fine. Others around us had trucks as well, and “came prepared” - they backed in and piled bean bags, blankets and pillows all around and got real comfy! Once the snack bar commercials started we had to really laugh, because after all these years…those hadn’t changed! 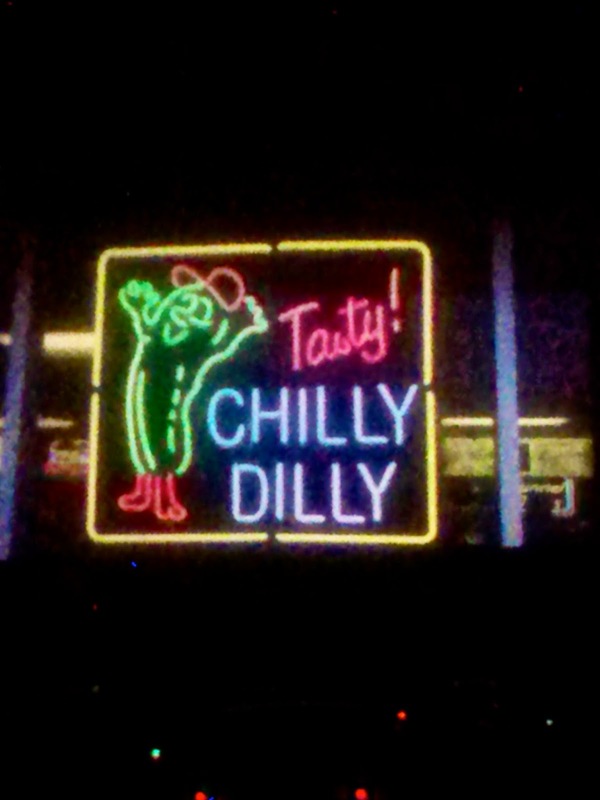 About the only thing different that we could see was the addition of “Chilly Willy” which is a pickle. I think it’s a regional thing here, because I see pickles advertised in a lot of quickie stops around the mid-west. A few sprinkles showed up, which brought some of the outsiders into their trucks for a little while, but then it cleared right back up again, so not a big deal. The first movie was good. The second got really weird, and by the second half it had reached midnight and we’d had enough, so called it a night. I got my kiss, it was a great evening! 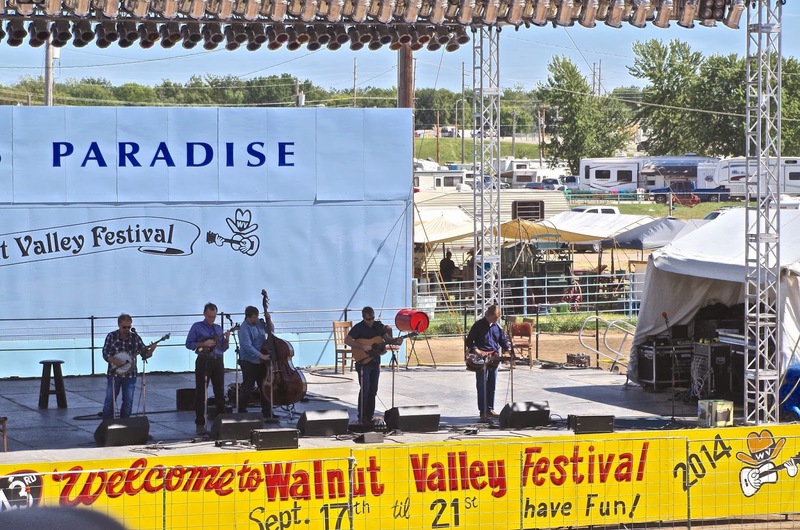 We had to stick around Wichita extra days to have some work done on our awning, and since we were going to be there over the weekend anyway, I told Jack that I heard that there was a Bluegrass Festival going on nearby we should attend. We had to depend on the service guys each day to let us know when they were going to do the work on the awning, so we never quite knew what our day was going to be like. We had hoped to go to the festival on Saturday, but that turned out to be the day they ended up doing the work - smack dab in the middle of the day, so no use making the drive over to Winfield. We chose Sunday, which was the last day. 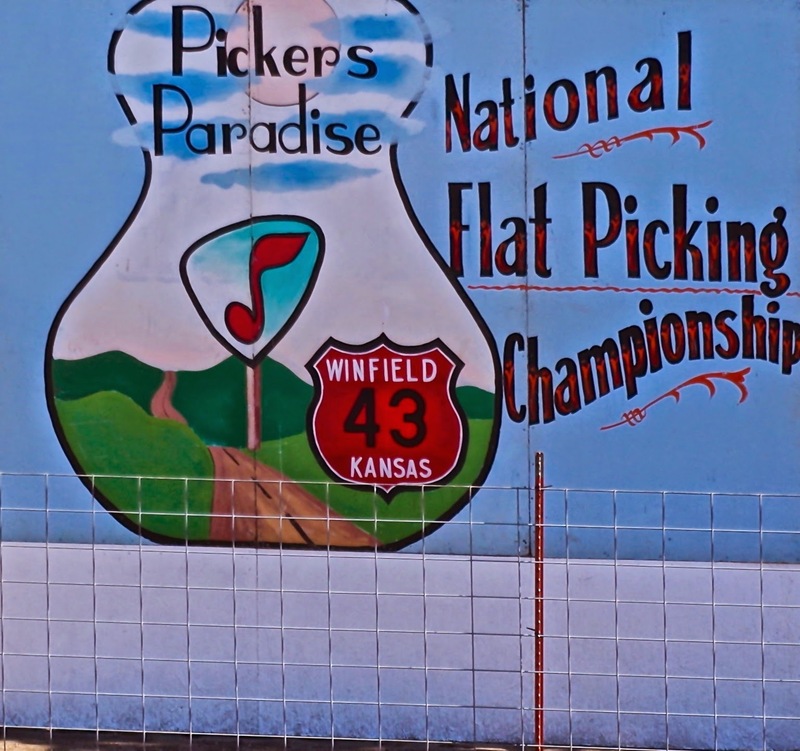 Walnut Valley Festival in Winfield Kansas is evidently a very BIG deal, especially for “National Flat-Picking Championships”. 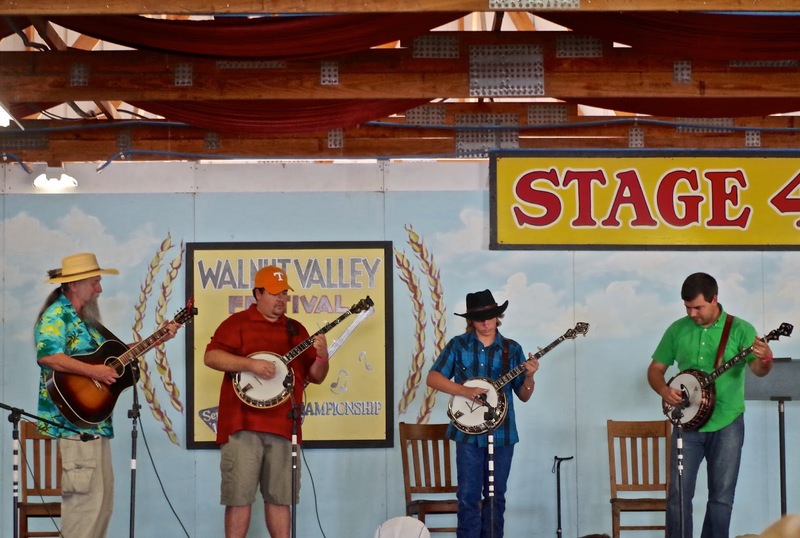 We missed the guitar competition on Saturday, but was able to see the banjo competition on Sunday, and was so glad we did! What a delight it was too! Wow! 20 superb players in all. After that we were able to catch a couple of fun Bluegrass acts, one called the Boxcars that were especially good. 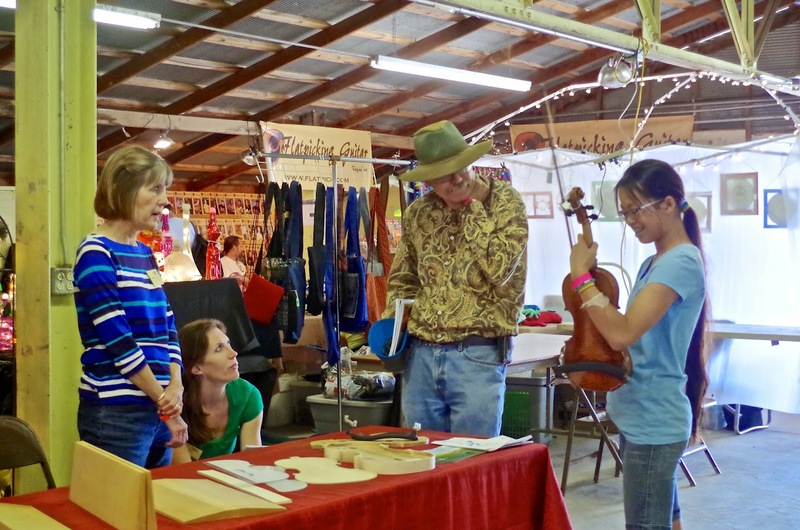 It was equally entertaining to walk through the vendor areas as they were filled with all the various instruments, straps, picks, jewelry, music, etc that musicians and people in this field or followers would be interested in, plus the usual assortment of western wear and “stuff”. We’re told that almost more music is played in the adjoining campgrounds as that at the festival. It sure would be a fun adventure to plan on attending some year! Wichita itself wasn’t a big draw for us, and we only stayed as long as we did because of the work that we were having done, but because of that work delay, it afforded us the opportunity to experience a couple of things we wouldn’t normally have been able to do…so for that, thank you Wichita, we had fun! We thought we would go to Wichita for awhile...after all, it was the largest city in Kansas, and we'd never been to Kansas before, so, off we went! 382,368 people live here according to the AAA book, which usually means "there's plenty to keep us busy for 3 or 4 days!" So, we booked ourselves into the nicest campground we could find and settled ourselves in. We had some maintenance work that needed to be tended to on the rig, and it turned out that a great service place was just across the street, so that worked in our favor as well. 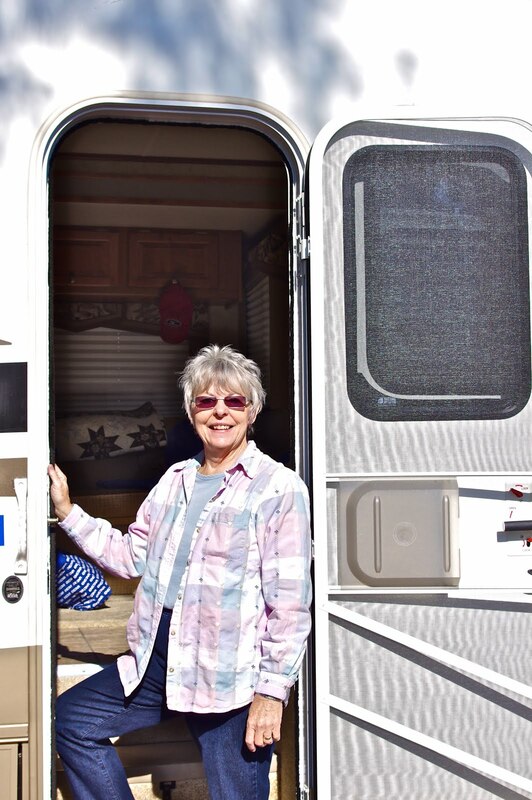 We started with the most important thing...the RV Service Center, to make sure they could fix our awning. They could, but would need to order the parts. Done. Next, we decided to drive through "downtown/old town Wichita". We like finding the "old" parts of towns, where they have been revitalized and usually turned into fun shops and restaurants. We love to see the old buildings; so that's where we headed. It was Sunday, so the streets were pretty empty - which can be a good thing when you don't know where you are going and find a lot of one way streets! We did find their "old town", and stopped for a nice lunch in a fun place, but the rest of the area hadn't done much else but a few more pubs. We couldn't really find any shops to speak of, nothing to go "browsing along". Kind of disappointing. They do have a couple of fun areas we did happen along tho - one is on their Douglas Ave - it's a whole bunch of bronze sculptures, scattered here and there - no names, no rhymes or reasons. I had to Google them to find out about them! 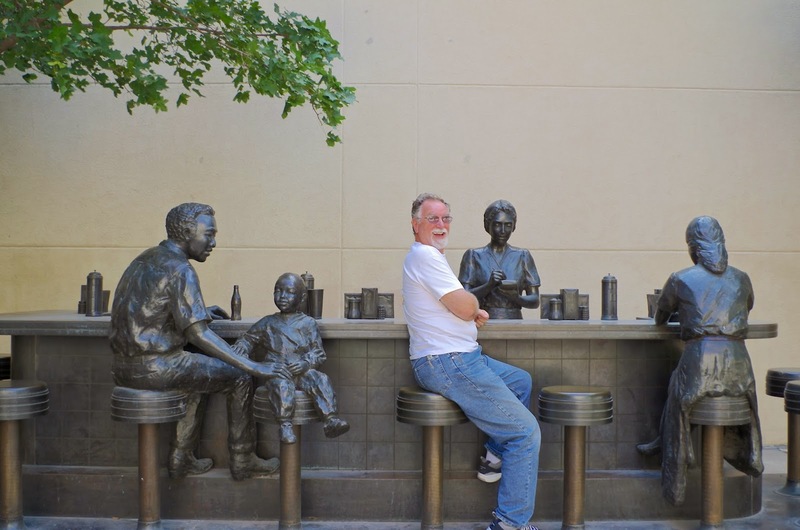 It seems that back in 1991 the city used a grant and commissioned artist Georgia Gerber to design about 30 whimsical sculpture. 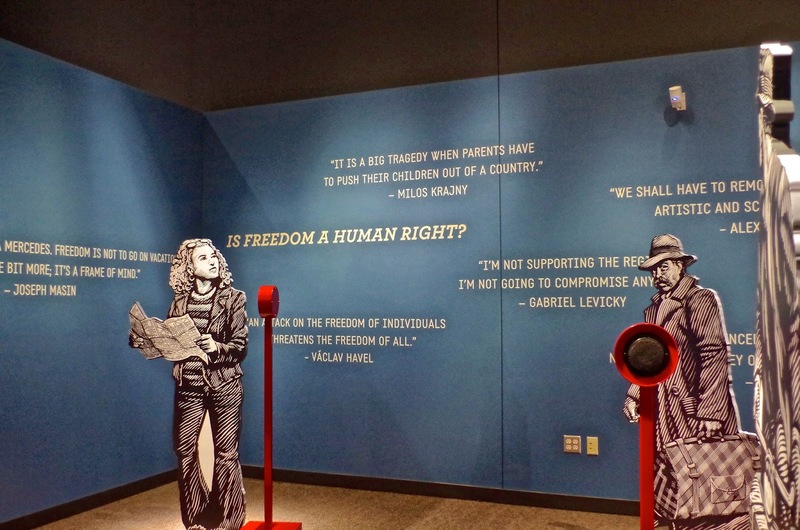 Some are a bit more "serious" like the one called "Woolworth"s Lunch Counter" depicting the '60s Civil Rights sit in, but most are just fun. 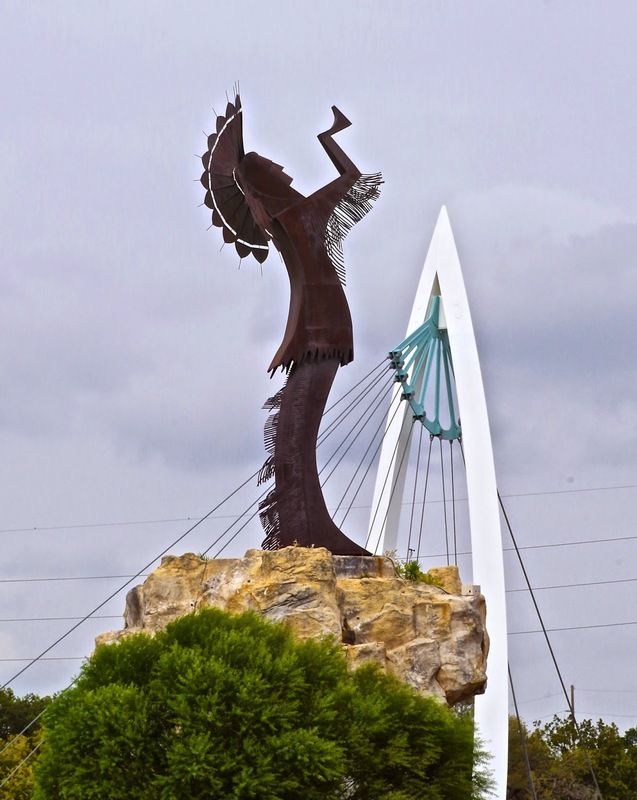 Another interesting area they have is the "Keeper of the Plains Plaza". It's a point where the Big and Little Arkansas rivers join together in downtown Wichita. 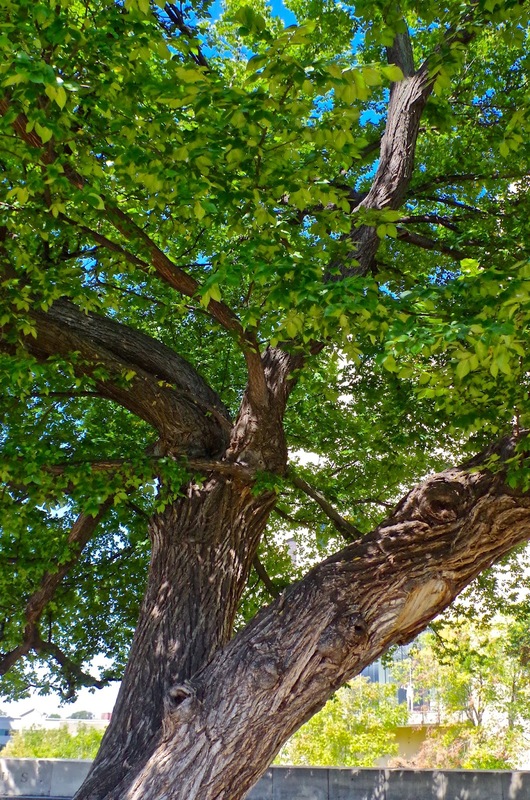 This land between the two rivers is sacred ground to the Native American people and is also home to the All-American Indian Center. 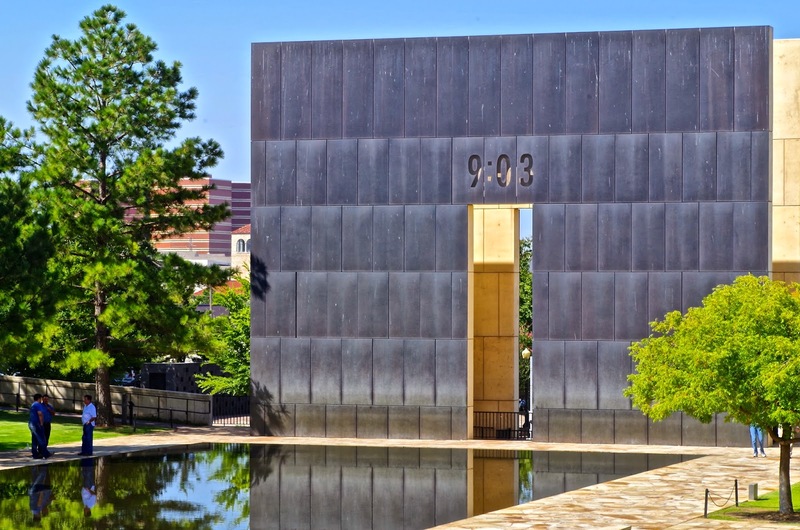 Standing at this point is a 44-foot tall steel sculpture. Pretty impressive. You can see him from just about anywhere. We tried going to the Cowtown Museum, it was closed for a private party. 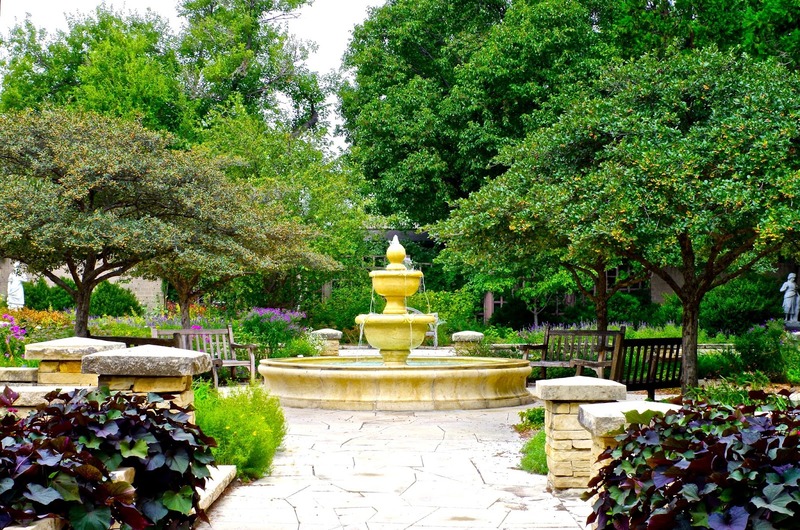 We went to the Botanica Gardens instead. Glad we did. Lovely gardens. 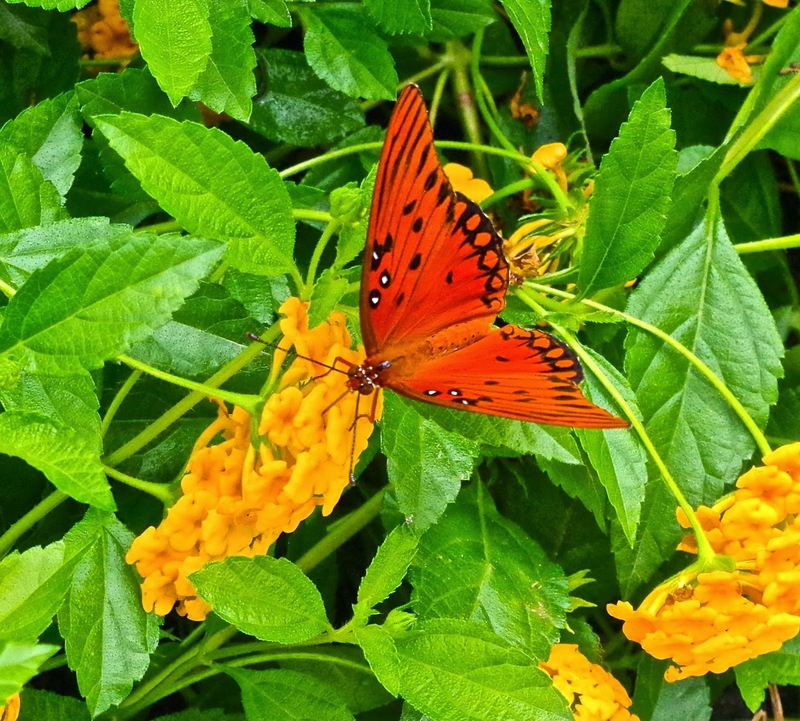 There were more birds and butterflies flying around in this garden than I had seen in any garden ever! It was kind of funny, they had a "special bird garden", but none was there, they were all out in the rest of the garden (having a grand ole time)! 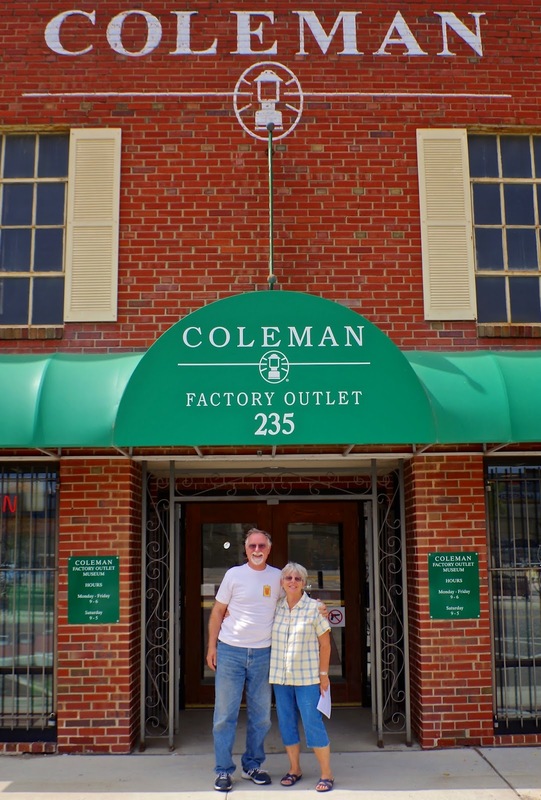 The following day we ventured over to the Coleman Factory Outlet & Museum. 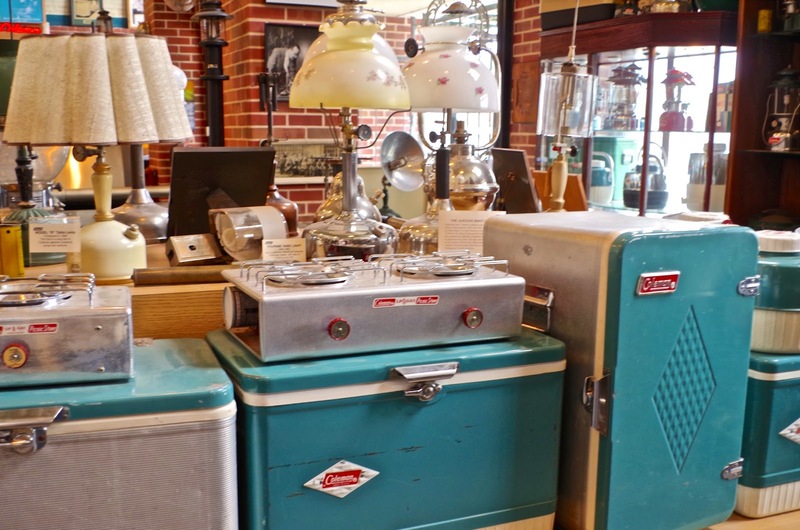 What a hoot to see all the old, original lanterns and stoves! It brought back some fond memories for both Jack and I as we had both "gone camping" as youngsters. He with the scouts and me with my family. My how things have changed...and yet not so much. An interesting history, the origin of Coleman lamps! Coleman's "Efficient Lamp" has been produced in Wichita since the beginning, 1902, and the factory is still here today. While we were there, we met the nicest lady who asked us if we had stopped in at the "nut house" yet? No... "Oh, you must! It's just down the street, has every kind of old fashioned candy & chocolate, it's great!" "Great!" Jack said, so off we go! 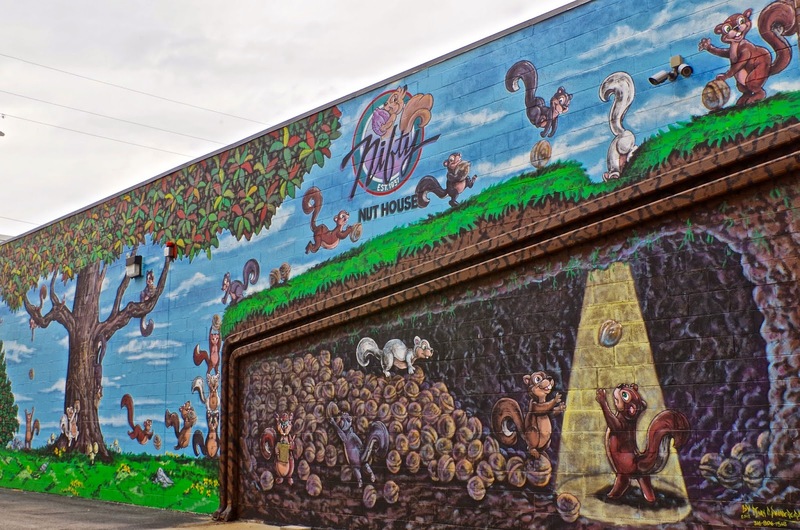 Nifty Nut House, wow, what a place! You could get lost there, well...we almost did! At least I thought I lost Jack there! OMG, not only every kind of nut there is in this world, but just about every kind of candy too! Oh, and dried fruit, and a whole lot of other stuff. Just, WOW! The first was our visit to the Mill City Museum in Minneapolis MN. 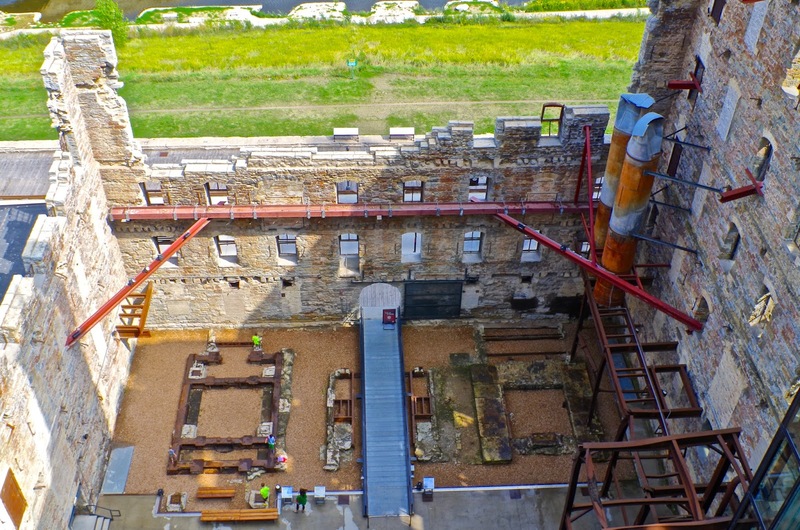 The museum is built within the ruins of the historic Washburn A Mill, which later became General Mills. The largest and most technologically advanced flour mill in the world when it was completed in 1880. We had a wonderful guide who shared with us some of the history of the mill (and even the downtown area of Minneapolis). Millers at the Washburn A Mill Complex in the 1870s perfected a new process for milling, a revolution that made fine white flour available to the masses for the first time. 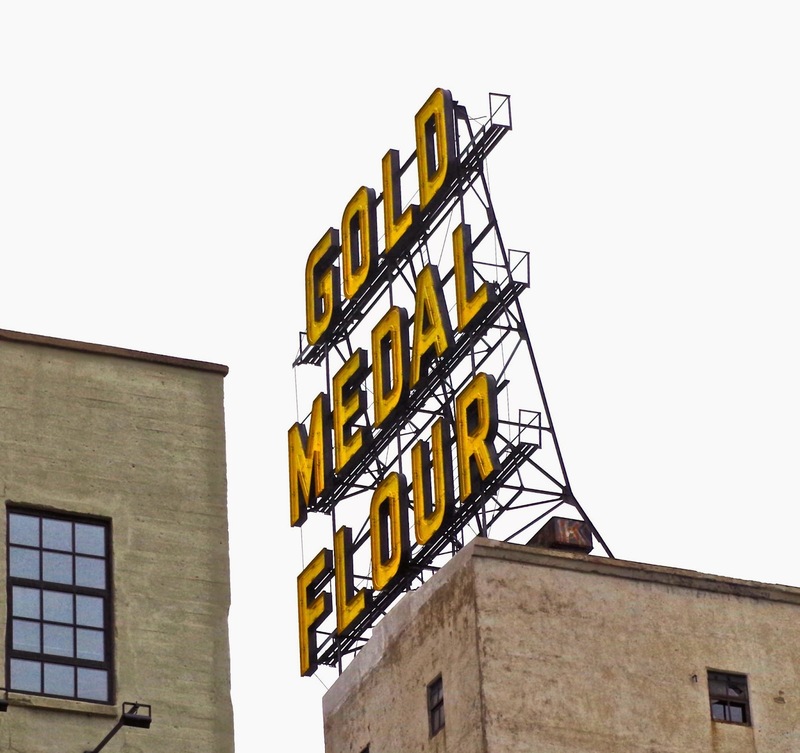 Soon, thereafter Minneapolis became the flour milling capital of the world, a title it held from 1880 to 1930! Because of the flour dust, fire was always a huge risk, and several broke out - here as well as other places. The first was in 1878, killing 18 workers and destroying a third of the city's flour milling capacity. In 1878 the First Washburn A Mill exploded. Again in 1928, fire destroyed the south side of the Washburn A Mill, closing it in 1965. In 1991 fire guts the abandoned mill (homeless suspected). 2003 Mill City Museum opened. 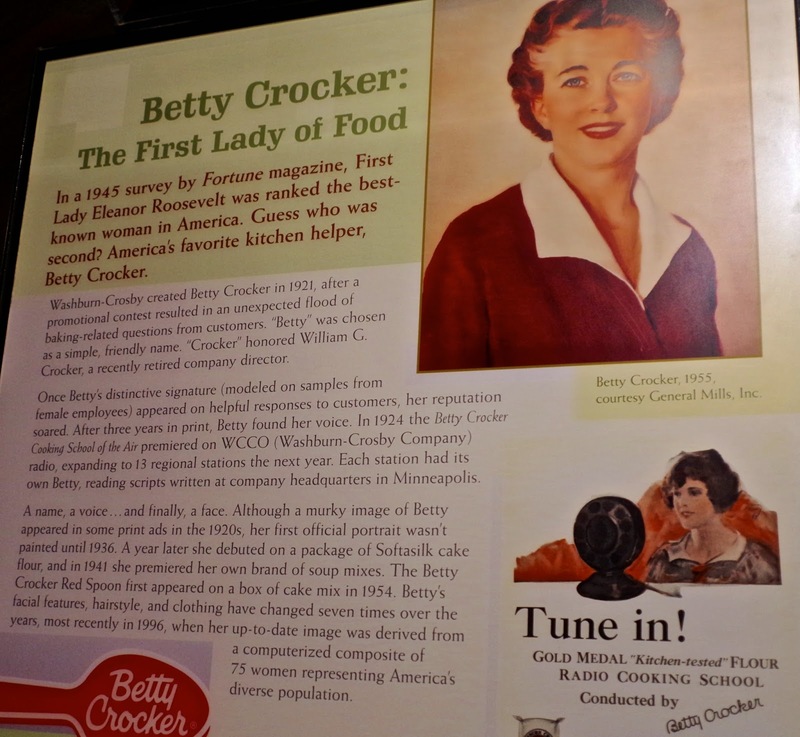 We learned so much there, not only about the (flour) milling, but about icons - Betty Crocker (a marketing composite) and how Bisquick came about (on a train trip, where General Mills sales exec. was served hot biscuits, and found the cook to ask him "how he was able to do that -" premix the ingredients and refrigerate them ahead of time"!). 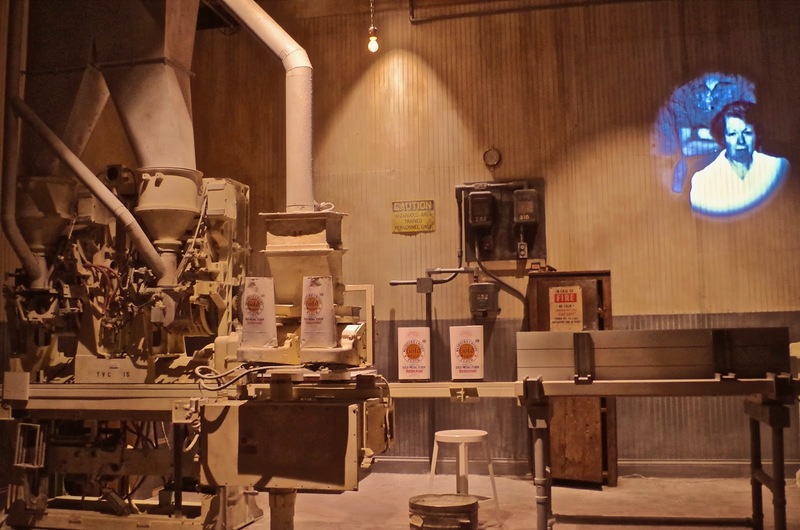 They even had a hands-on Water & Baking Labs! What a great place that was, we were there almost all day! 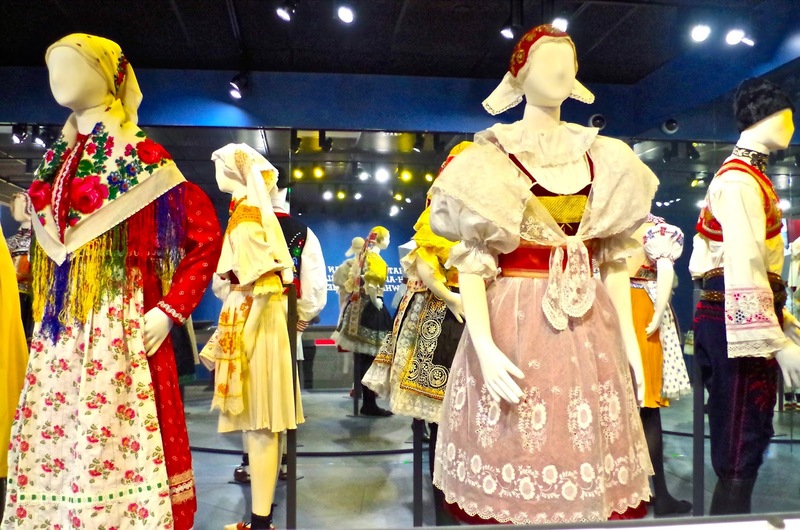 Another "eye opener" was The National Czech & Slovak Museum in Cedar Rapids IA - when we were visiting the Amana Colonies. Now, I will have to admit, I know next to nothing about the history of the Czech & Slovak community...so here was my chance! What a beautiful museum. 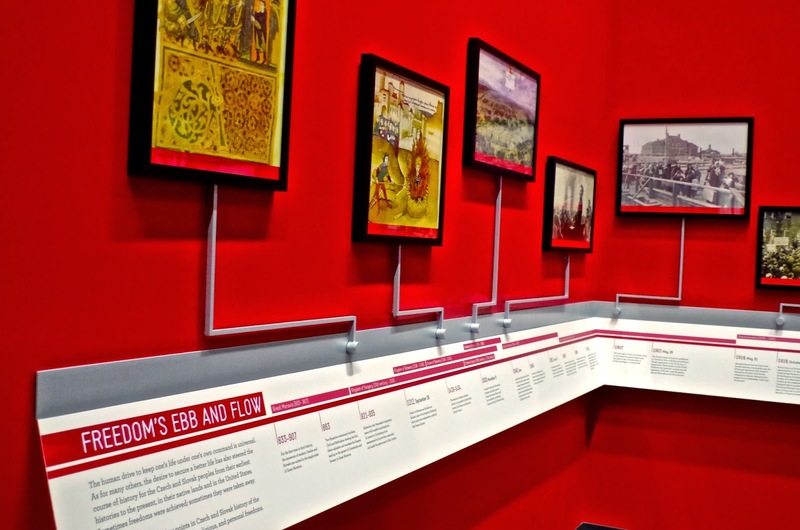 It had a nice selection of exhibits explaining their various holidays, costumes, traditions, religion etc. throughout the country - but the real story there was their big exhibit called "Faces of Freedom". It was amazing, it did a wonderful job of showing what sacrifices were made by the Czech people, in spite of boundary changes from 1919 to 1992 and the suffering, especially in WWI & WWII. Powerful stuff. Pretty impressive people. 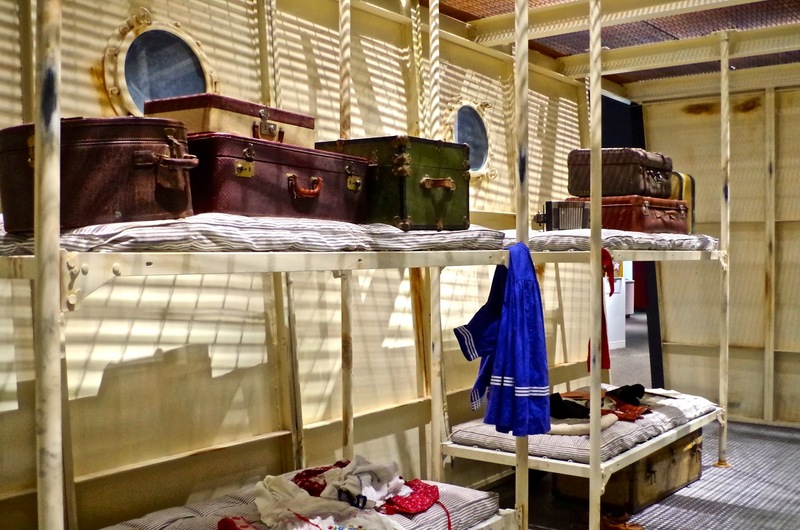 The museum did a great job even including the replica of the steerage section of a steamer ship that brought immigrants to America! The museum is located in the Czech Village, which unfortunately, most of the shops were closed that day due to being "off season", so we didn't get to visit, but looked pretty cool. 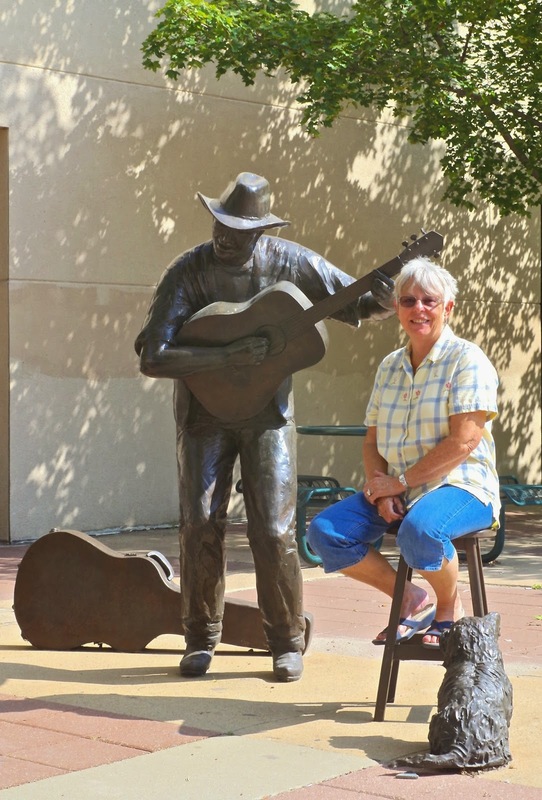 We had stopped to camp at the Amana Colonies in Iowa because we thought they would be fun and interesting (they were), but found so much more with our little side trip to Cedar Rapids...learning something new is so much more fun! Somethings that just make you go "Wow"! Let's face it, the thrill of traveling is seeing new places, learning new things and visiting sights we may have heard or read about. I'm constantly trying to research the cities and towns en route of where we might be going through or nearby, and have several books that I look through to help me with. Then there is always our "interests" to throw into the mix! Jack likes WWII museums and we both like factory tours for instance. We also keep in mind our family and friend's interest as well, just in case (we always have to be prepared for "shopping ideas" you know!). One such place came about when we were looking up a route through Minnesota. 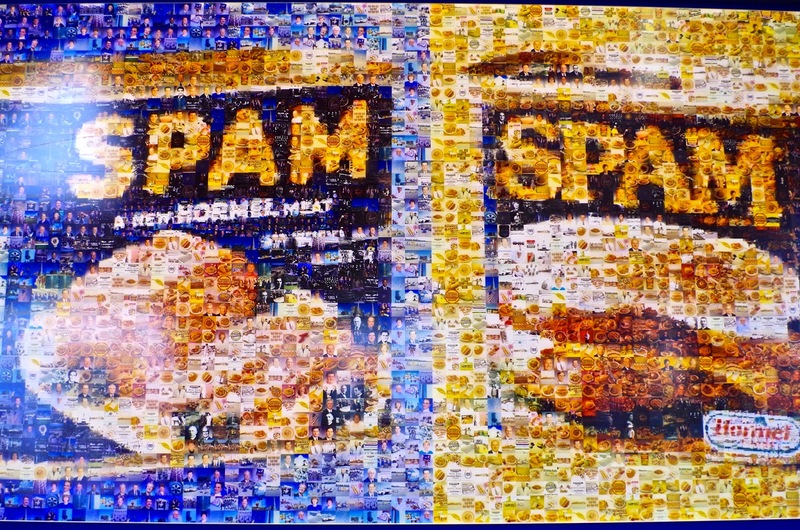 I discovered that SPAM was made in Austin MN and that Hormel had a museum and tour there! 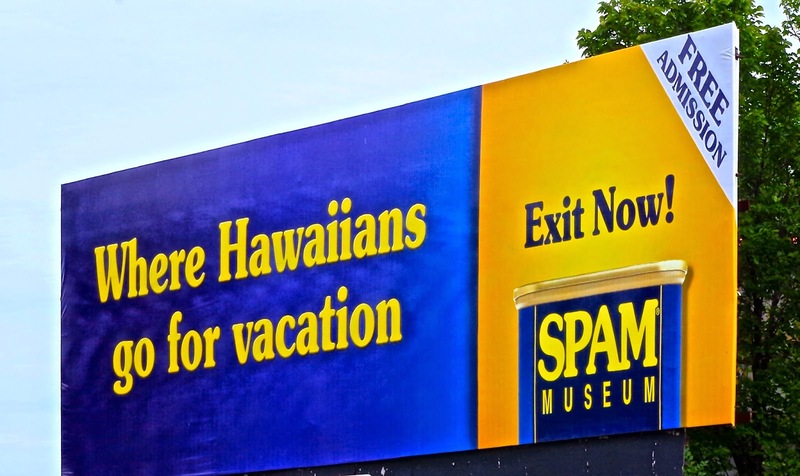 I have a son who loves SPAM! He's crazy about the stuff, so how could we not go there? What a hoot! From the moment you enter, you are inundated with the famous little can! 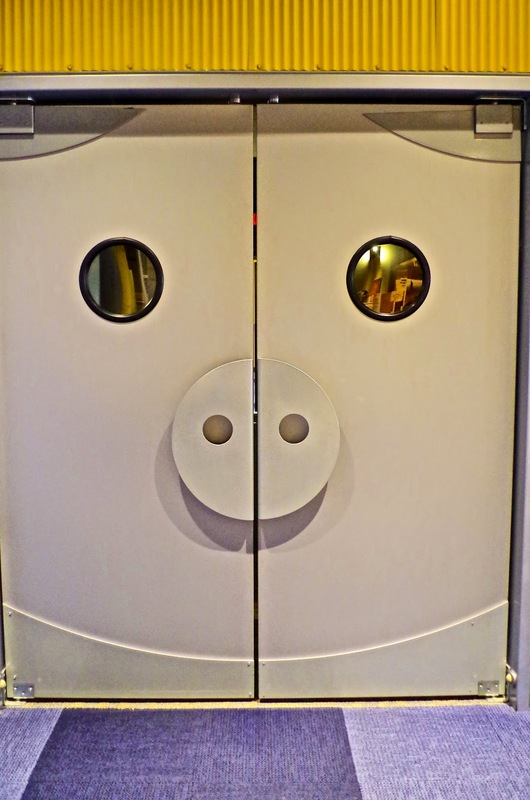 After you are cheerfully greeted, you enter through the cute "piggy" doors to the theater to view a short film giving you a nice over-view of how George Hormel came up with the idea for SPAM (using all the parts of the ham), how they came up with the name (an actor did, taking the letters for shoulder of port and ham). 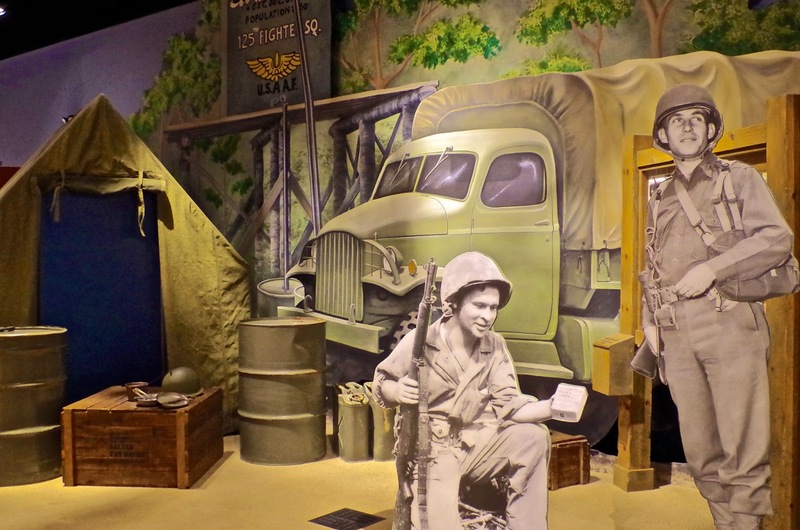 The museum does a great job showing you what an important part it played during the war because of it's ability to be shipped (and stored) all over the world, it supplied all our troops and our allied troops with the much needed protein that they wouldn't have been able to get otherwise. Because of the way it's preserved in cans, it's become a staple in many overseas lands, with Hawaii & Guam being the leaders. Let's not forget the "real reason" we stopped...shopping! 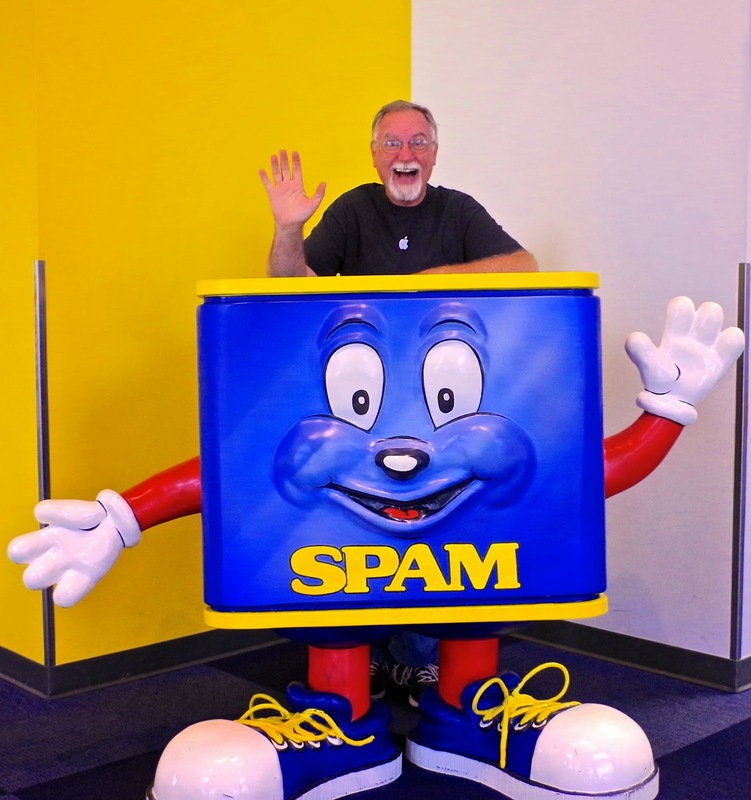 Who knew there were so many kinds of SPAM? Wow! ...and so many things to go with it too? What fun! The museum is closing Sept 28th until 2016 (building a new one) so we caught it just in time, phew! 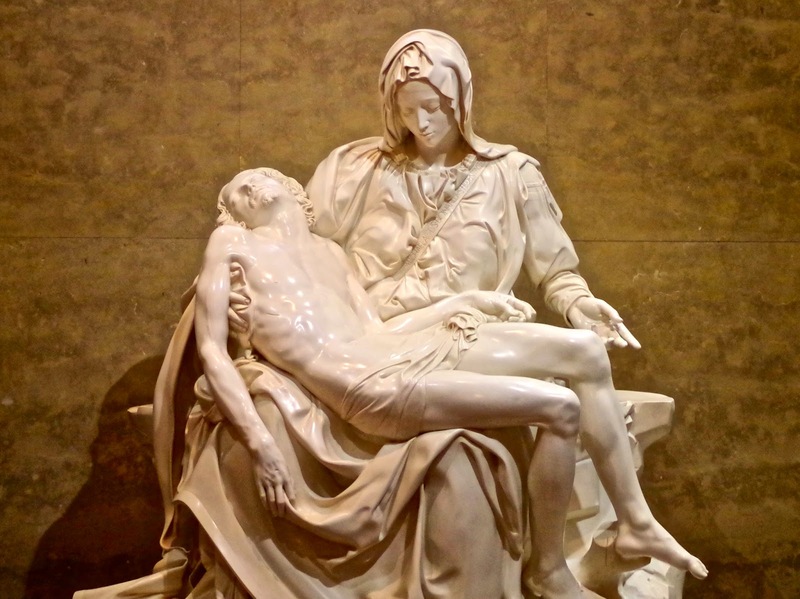 Always another "Wow" find, are churches. You just never know what your going to find when you read about a particular one, and "how spectacular" it's going to be, until you get there. 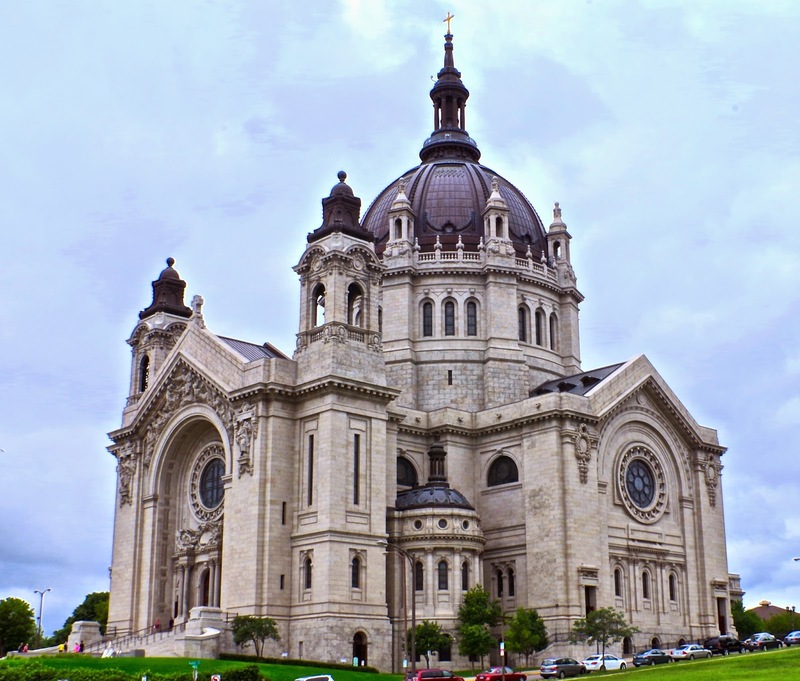 Such was the case with The Cathedral of Saint Paul, in St Paul MN. I guess the word "Cathedral" should have tipped me off...but it didn't...other than I figured it would be big. But "big" is relative, isn't it? This Cathedral isn't just big...it's huge! It seats 3000 people, and that's without an unobstructed view of the pulpit and altar. 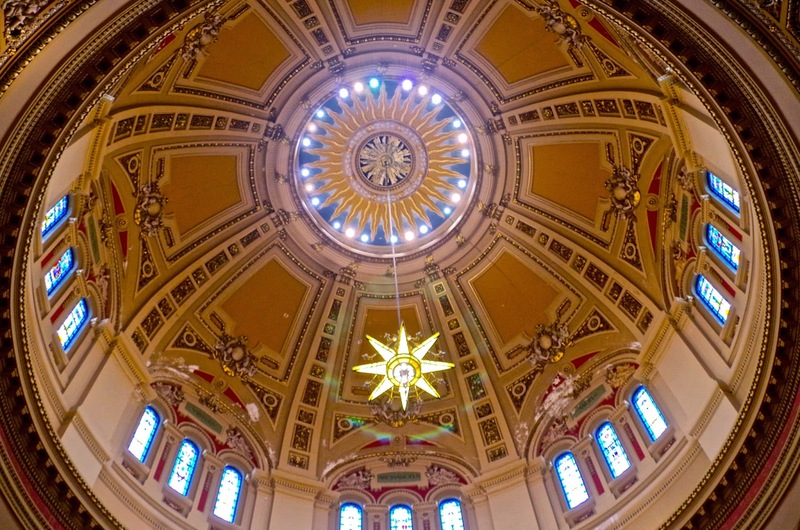 The Cathedral exterior measures 306 1/2' high to the top of the cross (interior - 186' to the apex of the inner dome ceiling). 307' long from the front steps to the sacristy door; and 216' wide from north to south transept. 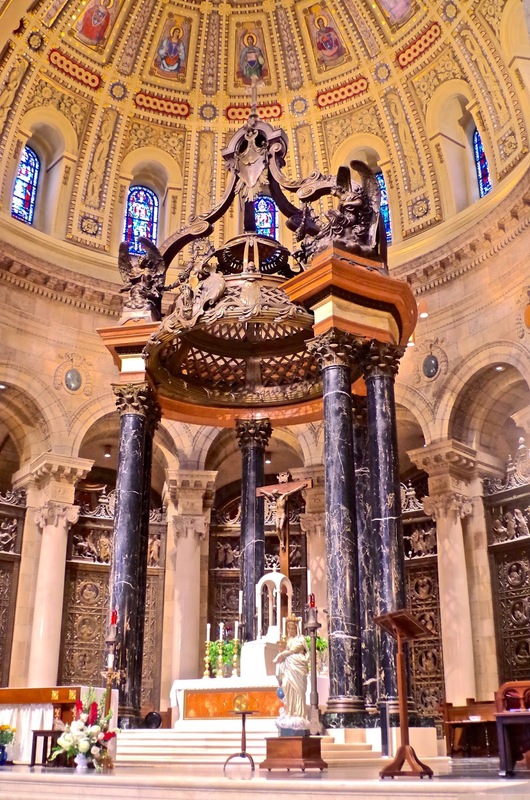 The Cathedral contains 33 different types of marble, from 11 countries and 4 continents. 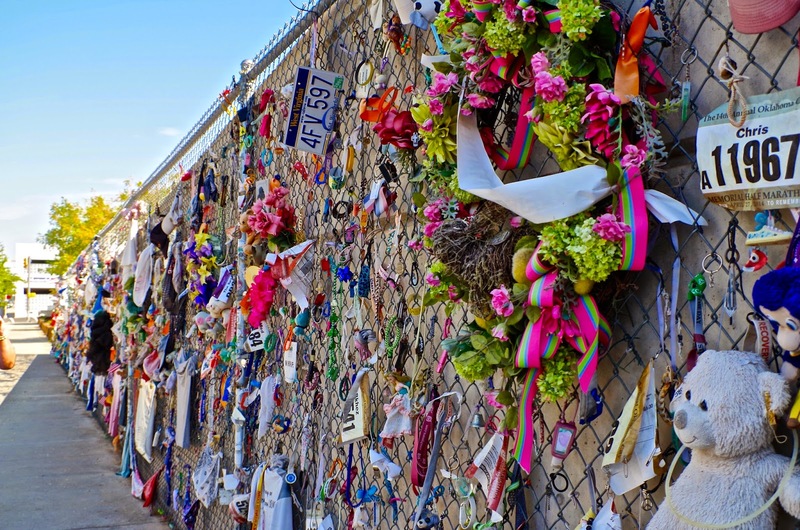 There are 97 different saints, prophets and patriarchs (several saints are pictured more than once). All that is just "statistics"...what's hard to put into "words" is how very beautiful it truly is. Several times I just had to sit, to take it all in, it was almost overwhelming. I'm not sure what I thought was more beautiful, the inside with all it's statues & marble or the outside with the black domes against the white walls. 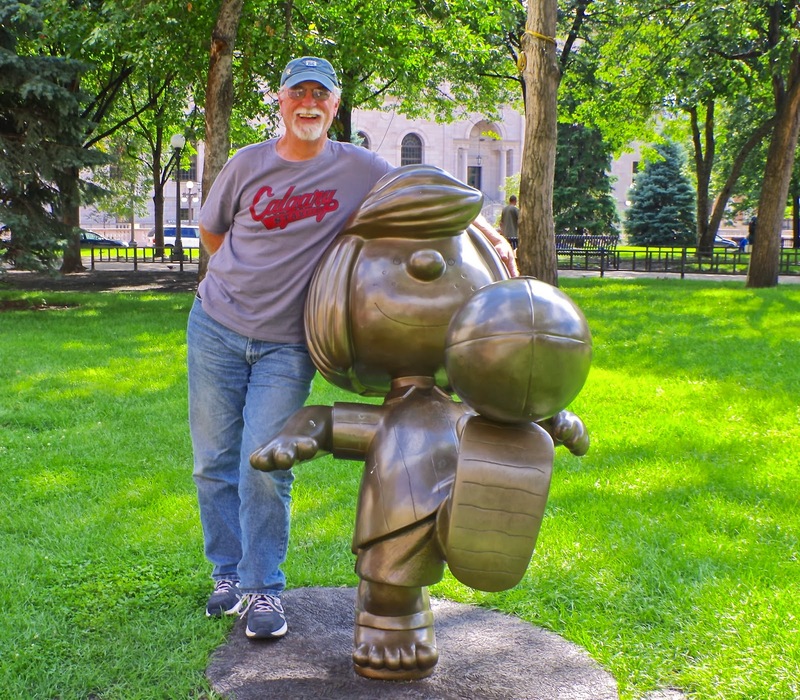 St Paul also gave us a bit of whimsy as well...as guess who grew up there? 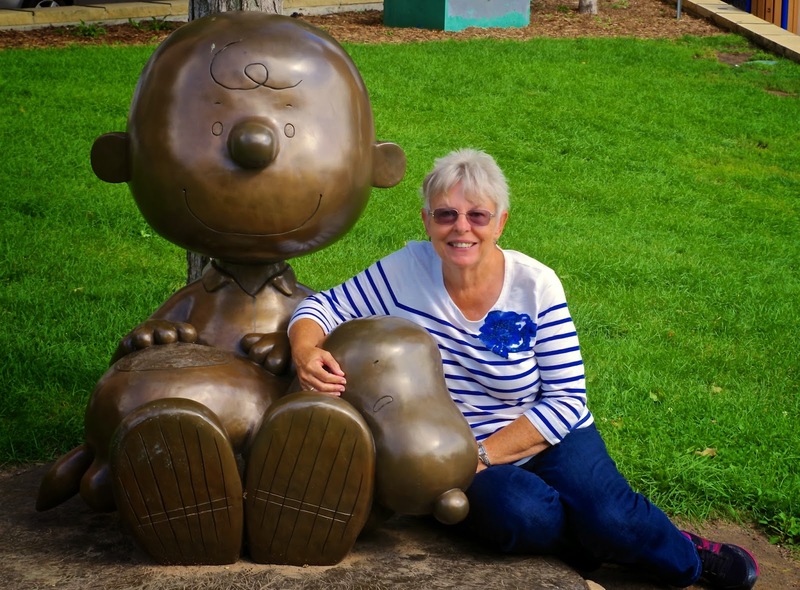 None other than Charles Schultz of the "Peanuts" gang! So...they have lovingly added sweet bronze statues throughout the city of all his various characters! Jack and I had a wonderful time tracking some of them down and "posing" ourselves with some of them! 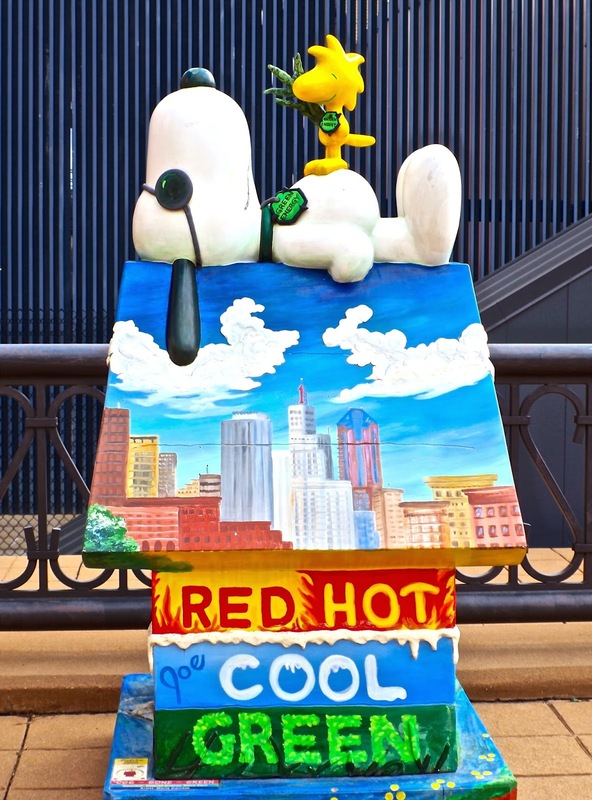 We even found a few of Snoopy's Dog Houses that various companies took advantage of using as advertising space! All fun! Our last two stops in Wisconsin! There's nothing more inspiring than seeing someones dreams come true...and we saw two really big ones while we were in Wisconsin! 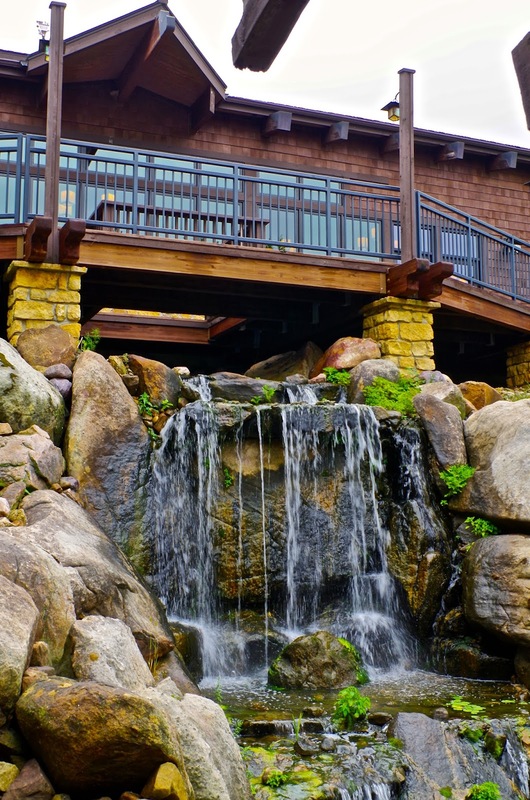 The first was Curly Lambeau's for his Green Bay Packers, and the second one was The House on the Rock in Spring Green. In 1945 Alex Jordan climbed a rocky tower and his imagination took flight. Not to much is known about the man, other than he was a "dreamer" with almost inexhaustible energy, expectations & creativity. He just kept adding one room on to another, then filling them with wonderful "gadgets" he would learn about or find. I think the "ultimate" room is his Infinity Room, an engineering marvel envisioned by Jordan in the 1940s. 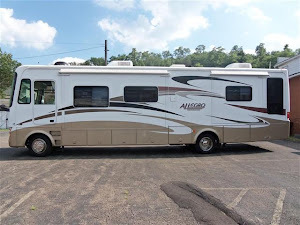 It is 218 feet long and has 3264 windows. 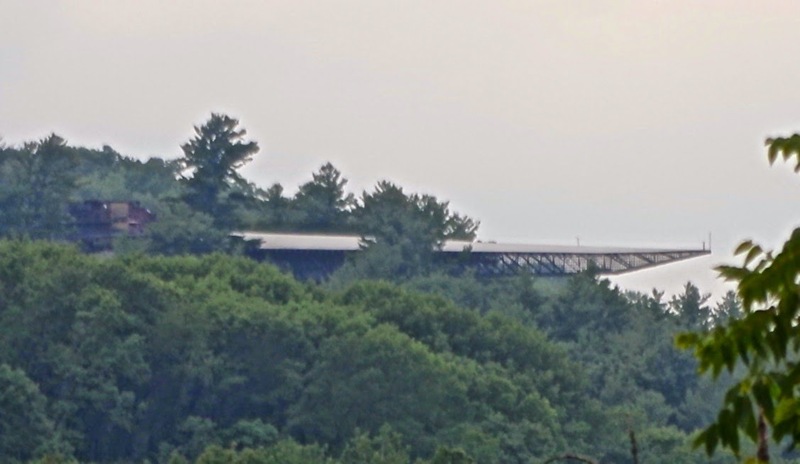 It is counter balanced by 105 yards of concrete, making it possible for the last 140 feet to extend unsupported 15 stories above the valley floor. It's beautiful. A lot of the Main House, which he built first, had low ceilings (which was odd, since he was 6'2") and built right into the rock, so pretty dark. Since it was built in mostly in the 1950's it was "dated", but still had massive fireplaces and nooks of waterfalls that were really nice. It was like a maze, going from room to room, nook to nook (like little reading areas). The tour is done by "sections" and we only opted to do the Main House and gardens, so we didn't go to see the Carousel, or some of the other buildings, but saw videos of what they offered...mind blowing, all the collections he had, more than many museums. He did something unusual, I think, One year before his death Jordan sold The House on the Rock to his close friends Art & Karen Donaldson. He did this (with the knowledge) that they would continue his dream. 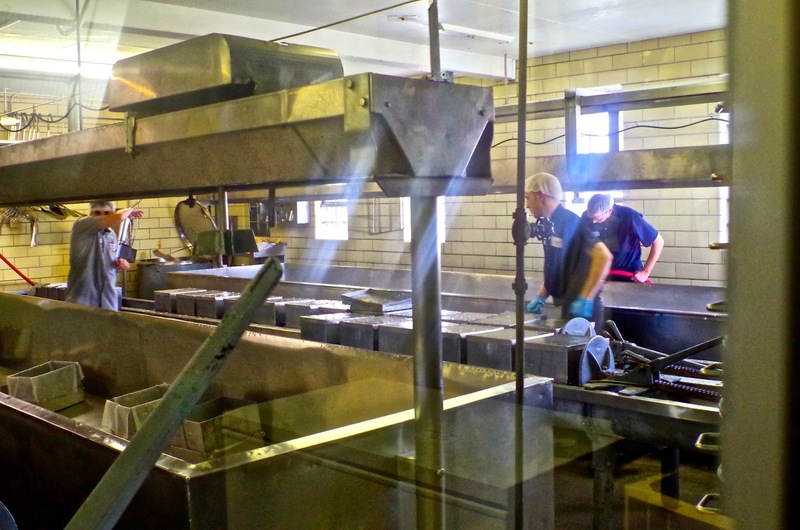 Our last stop...the one, you have to make when in Wisconsin, is to see cheese made!! 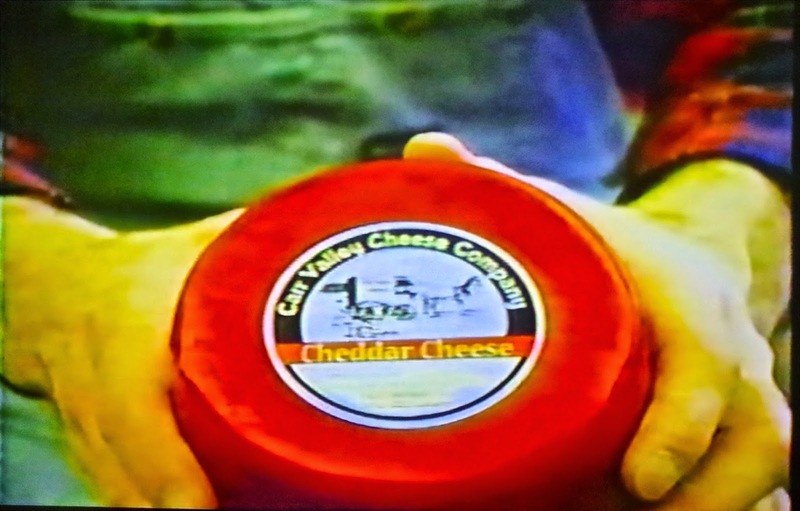 That was at Carr Valley Cheese Factory in La Valle. 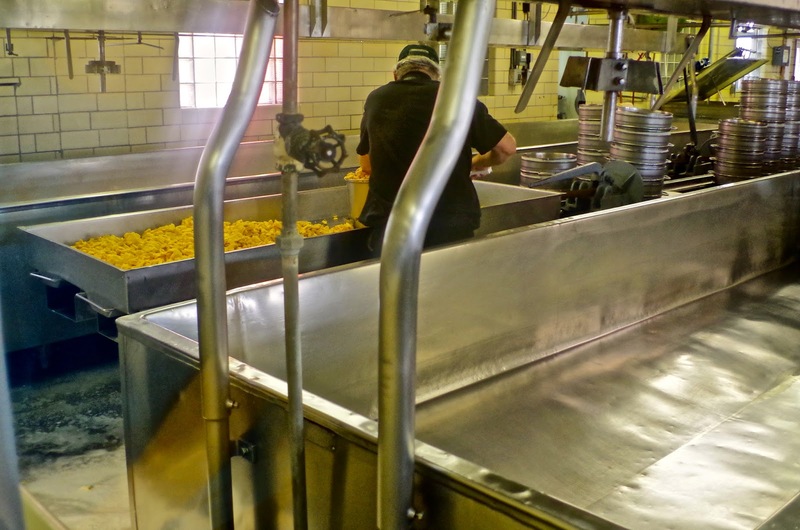 Now, Carr Valley Cheese Factory wasn't a very big place, and that turned out to be a good thing, because they make it the "old fashioned" way...by hand! Part of what that means is, we got to actually see it being made...not just some big metal containers sitting there with labels on them and a sign telling you that "cheese" is inside. 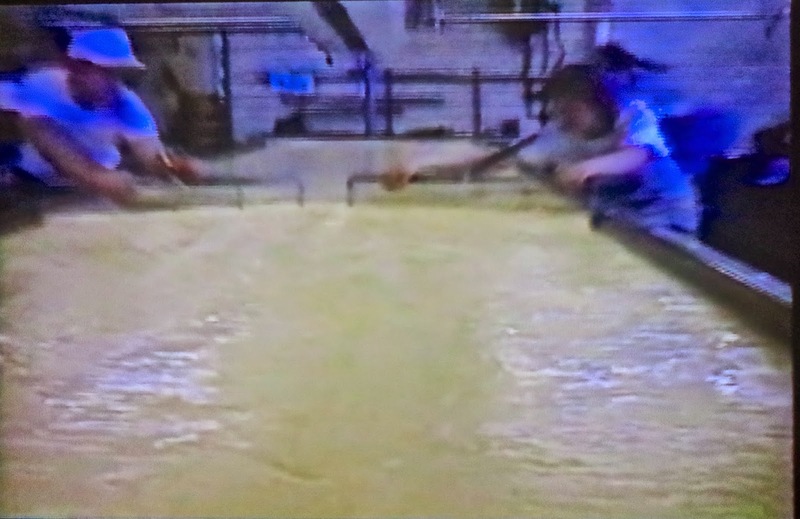 No, we saw humans standing along side long bins with all the ingredients mixing and "making" the actual cheese, then squeezing it into containers, cutting it into "curds" and...we got to taste fresh, just made curds! How about that! Ha! "Finally", I though, as I had seen it offered at so many places throughout Wisconsin, and so wondered what it tasted like! Well...now I know. Hmm, kind of bland. I'll take the "aged" cheddar, thank you! ;-) We got to sample 2 year, 5 year & 10 year aged cheddar and what a difference in each one! Jack likes Swiss and found a smoky one that he really liked, so we bought a few items and left very happy.